Recently, I was asked to review a patient with paranoid schizophrenia who is currently relapsing. He had been restarted on the antipsychotic Aripiprazole two weeks prior to me seeing him. He was starting to show signs of improvement; the voices were diminishing and he was gaining partial insight into the fact that the “pills” might be helping him. At the end of the interview, I decided to suggest an increase in the dose of Aripiprazole from 15mg to 20mg. I would be lying if I said that my decision was based on a review of the evidence for using Aripiprazole in schizophrenia. It was more based on the patient’s history of the use of the drug and his wife’s wishes to continue its use. I also had the safety net of knowing I would be seeing the patient again in 4 weeks time and would then be able to assess how effective it has been. But what if I had taken the time during the clinic to actually consider the evidence behind my “gut-feeling”? The Cochrane library is a resource that, again, most junior doctors will have accessed at some point during their training. The tag-line on their website “How do you know if one treatment will work better than another, or if it will do more harm than good?” sums up how we can use the library to support our practice. 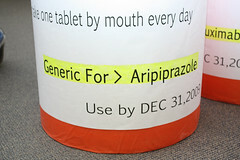 Using the keywords “Aripiprazole” and “schizophrenia”, the Cochrane website found a summary article entitled “Aripiprazole for Schizophrenia”, published on 28th March 2013. The authors had searched the Cochrane Schizophrenia Group’s register for all clinical randomised trials comparing Aripiprazole with placebo, typical or atypical antipsychotic drugs for schizophrenia and schizophrenia-like psychoses since 2005. They found that, compared with placebo, Aripiprazole significantly reduced the chance of relapse in schizophrenia in both the short and medium term. Compared with other typical and atypical antipsychotics, Aripiprazole did not show any greater treatment response, efficacy or tolerability, although it may lower the risk of akathesia, high prolactin levels and a prolonged QTc. So, in plain English, my simple search of the evidence informed me that my gut-feeling was partially correct; Aripiprazole is effective in treating schizophrenia and preventing relapses but there is no evidence-based reason to prescribe it rather than any other typical or atypical antipsychotic. Using an EBM approach does not mean that we only look to the evidence to inform our practice. Often, we use a combination of our clinical experience and expertise, as well as the wishes of the individual patient to provide the best treatment for them. However, treating patients without any regard for the evidence puts us in a tricky position ethically and medico-legally. As this case highlights, the use of EBM can support us in our practice and give us the confidence to know that our “gut-feeling” is in line with current research.